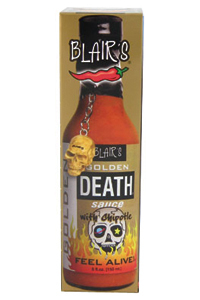 Blair's Golden Death Sauce with Chipotle is the latest creation from the gastro-psycho man himself, Blair! His newest creation is made with pepper fanatics favorite chile, the Chipotle, as well as a heapin' helping of Habaneros! Blair has really created a great new sauce that comes with his traditional trademark, the SKULL keychain! Enjoy this sauce, it is a good one! I received this as part of a gift of hot sauces. I asked for this one because of the "8" rating that Mo Hotta gave it. However, if you look at the box it comes in, Blair has it heat rated as his third mildest (I would not have asked for it had I known that)! I really do enjoy the sauce despite it not being hot (for me). I'd say my only real complaint is that the mustard seed is a bit stronger than I'd like for a pepper sauce. I'd just assume get hot mustard if I wanted the flavor that strong. Maybe it's just the bottle I got? If you're looking for heat, don't waste your money on this...nice flavor, but it leaves a lot to be desired in the heat category. Ingredients: Scotch Bonnet Pepper, Fresh Onion, Cane Vinegar, Mustard Seeds, Habanero Powder, Salt, Tumeric, and Ascorbic Acid.